Getting the greatest value out of your time and money in central Hokkaido has never been easier. 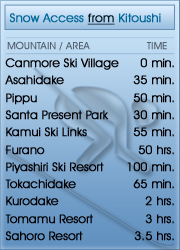 and adjacent Canmore Ski Village can be found a mere 25~30 minutes by car from Asahikawa City centre in Higashikawa Town. 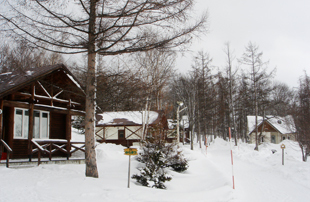 It sits at the foot of the Daisetsuzan mountain range, making it the perfect starting point for a thorough tour of central and northern Hokkaido ski fields. come in three varieties, Type A for a maximum of 6 people, Type B catering for up to 8 people, and the Party Cabin, Type C, likewise available for up to 8 people, but with a few special extras. 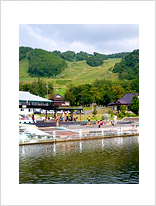 The price ranges from ¥15,750 to ¥26,250 per night, and discounts may be available depending on the length of stay. All cabins are fully contained giving you the freedom to schedule your activities as you see fit. THe smaller Type A cabins provide only Japanese-style futon bedding, while the larger Type B & C cabins have one separate bedroom with the remaining bedding futon. Details are available below. is a relatively small hill but one that boasts a good cover of near-perfect powder snow. Although you will more than likely want to take day trips to some of the more challenging ski slopes listed above, it's reassuring to know that when you come back to your accommodation, you'll be able to hit-up a night session just a matter of meters from your front door. The night sessions run until 10pm. Your central location in Higashikawa means there are quality ski hills in all directions. When one hill is closed due to poor weather, you can easily find one that is open elsewhere. You would be very unlucky to experience any downtime. This is the significant benefit of staying at Kitoushi. Not only will you have your own ski slope a matter of meters from your doorstep, you will, more importantly, find yourself in the unique position of being able to ski a new hill each day, given a small amount of travel time. It must be said however, that a rental car is essential to make this work, and this tends to stretch people's budgets. The good news is that recently getting around by hire-car has grown in popularity, and the rates have really come down. Although accessible via public transport, we strongly recommend that you hire a car for getting around, particularly when there's ski gear involved. 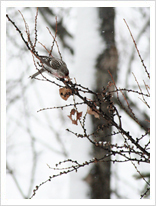 There is a 10% discount on lift passes at Canmore Ski Village if staying at Kitoushi. discounts offered on longer stays.